A Memorial area family commissioned us to create a natural swimming pool in their back yard. The family already had a standard pool on premises, but it was isolated in an area of the yard not particularly suited to seating guests or hosting get-togethers. 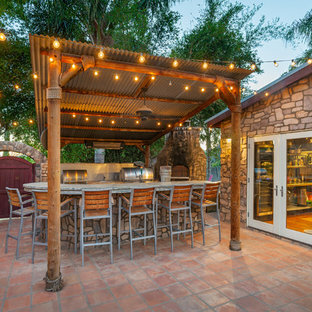 What they wanted was a second, natural swimming pool built that would serve as the hub of a new home outdoor entertainment area consisting of a new stone patio, comfortable outdoor seating, and a fire pit. They wanted to create something unique that would preserve as much of the natural features of the landscape as possible, but that would also be completely safe and fully functional as a swimming pool. 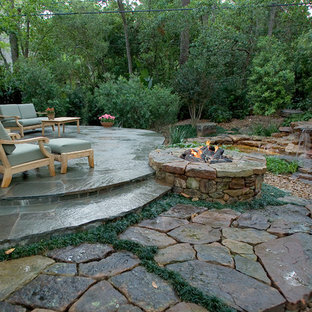 We decided to design this new landscaping plan around a pre-existent waterfall that was already on the property. 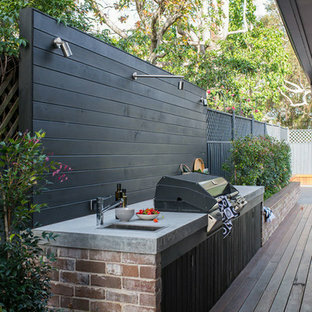 This feature was too attractive to ignore, and provided the ideal anchor point for a new gathering area. The fountain had been designed to mimic a natural waterfall, with stones laid on top of one another in such a way as to look like a mountain cliff where water spontaneously springs from the top and cascades down the rocks. At first glance, many would miss the opportunity that such a structure provides; assuming that a fountain designed like a cliff would have to be completely replaced to install a natural swimming pool. 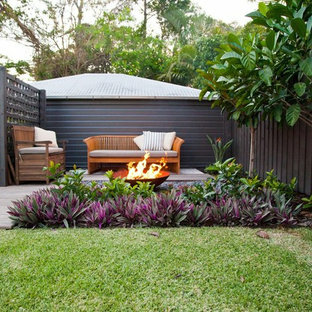 Our landscaping designers, however, came up with a landscape plan to transform one archetypal form into the other by simply adding to what was already there. At the base of the rocks we dug a basin. This basin was oblong in shape and varied in degrees of depth ranging from a few inches on the end to five feet in the middle. We directed the flow of the water toward one end of the basin, so that it flowed into the depression and created a swimming pool at the base of the rocks. 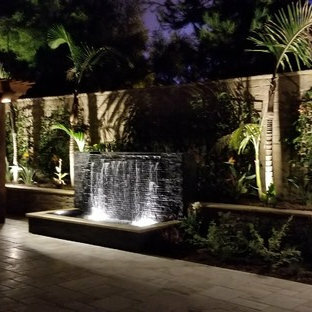 This was easy to accomplish because the fountain lay parallel to the top of a natural ravine located toward the back of the property, so water flow was maintained by gravity. This had the secondary effect of creating a new natural aesthetic. The addition of the basin transformed the fountain’s appearance to look more like a cliff you would see in a river, where the elevation suddenly drops, and water rushes over a series of rocks into a deeper pool below. Children and guests swimming in this new structure could actually imagine themselves in a Rocky Mountain River. We then heated the swimming pool so it could be enjoyed in the winter as well as the summer, and we also lit the pool using two types of luminaries for complimentary effects. For vegetation, we used mercury vapor down lights to backlight surrounding trees and to bring out the green color of foliage in and around the top of the rocks. 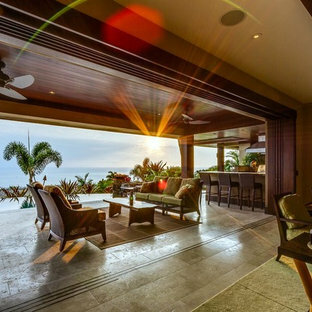 For the brown color of the rocks themselves, and to create a sparkling luminance rising up and out of the water, we installed incandescent, underwater up lights. 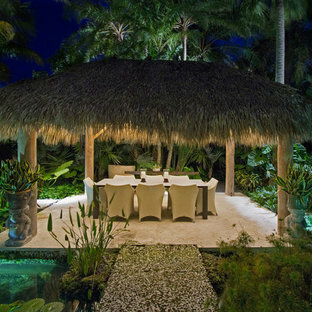 The lights were GFIC protected to make the natural swimming pool shock proof and safe for human use. 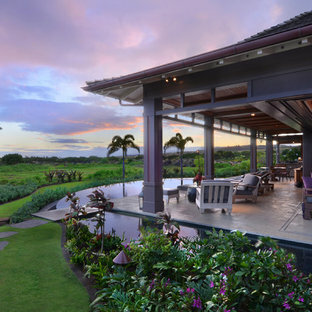 Outside patio with ocean view, from the Bali Pavilions on Kauai, built by Smith Brothers. 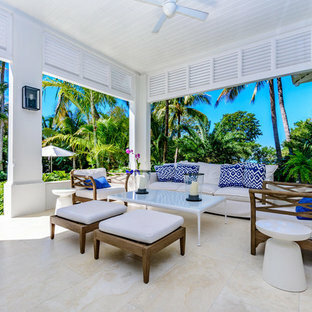 Covered patio with built-in grill and outside decor including table, lounge chairs and flowers. this is the actual courtyard area of the front patio. Beneath the cobalt blue wall is the koi pond. This was the 1st (we have 3 in total) pond we attempted. Although, this final version was completed about 5 years ago. We enlarged it, coated the inside w/concrete (instead of a liner) and did the stonework around the waterfall and outside area. Av Fine Wood Design, Inc.